Maddalena FRANCHI was born in the year 1796 in Vorno. Maria Maddela was born on 27th December 1794, daughter of Francesco Franchi and CHIARA MARIA BARBONCHIELLA. She married of Firmo Praccia from the same village in the year 1820. It was here that the family lived and worked the land. Records tell us than many from the village were described as peasants, living and working alongside their close relatives, parents, brothers, sisters, cousins etc. etc. Vorno was at that time a small village just south of Lucca in Toscana in Italy. Today it is really just a suburb of Lucca. The locals would have relied on working the land, growing vines for winemaking as even then the region was famous for its Tuscan wines. And of course the olives would have grown on the dry fertile lands much as they do today. The peasants would work the land and their masters would provide a roof over their heads in return for their hard work. Just before this time, and not long after the fall of the Medici family Tuscany fell into hard times and obscurity. Remembering that Italy was not unified until the 1860s and their provinces were really little countries of their own. The ruler of Tuscany at that time was an Austrian, the Duke of Lorraine. This Duke tried to modernise the province by reorganising local authorities, by enacting agricultural improvements and draining of some of the lands to enable better conditions for their vines. This would almost certainly have been how our ancestors lived here at this time. 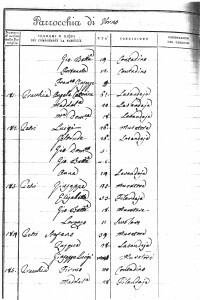 In the 1823 Cencus, we find Firmo Praccia who was aged 40 living with his wife Maddalena who was 28 years old. 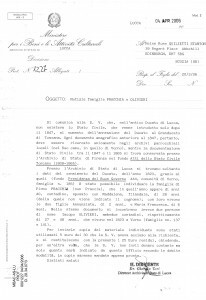 There is no indication on the cencus of Maddalena’s maiden surname. They had two children at the time Annunziata aged 2, born 1821 and Maria Francesca 6 months. These are Leonardo Quilietti’s elder siblings. There would have been no doubt that other children would have followed and can assume that their marriage would have been around the year 1820. Alongside them on the same cencus living right next door was Iacopo Olivieri aged 48 years old and his son Iacopo Olivieri aged 27 years. These were we believe Maddalena’s father and her brother. Iacopo Olivieri was the person who took the baby Leonardo to be baptised and handed him over to the hands of the orphanage in the year 1838. On the same cencus in the same street, living alongside Maddalena were other families with the surnames of Olivieri and Praccia. They would have been siblings, cousins, parents and grandparents. If you visit the Vorno cemetery today you will find the lairs filled to bursting with locals with these two surnames. No doubt that some of Leonardo’s siblings, cousins, and maybe even Maddalena herself will be laid to rest here.